Oceanview 1171 7 Bedrooms/3 baths! 2nd House back, only steps to the beach! Imagine your family vacation in a spacious, comfortable home just steps from the beach! Perfect for a group of friends or a family reunion. 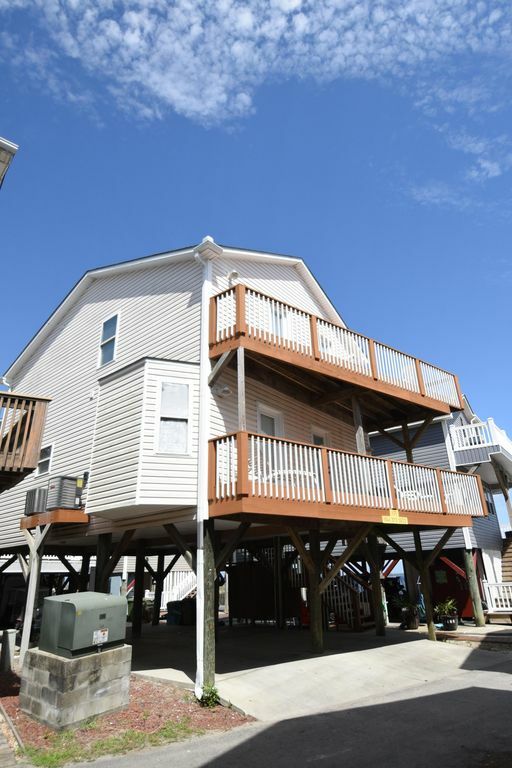 Enjoy our beautiful ocean view from any of the four decks on this house. Plenty of room to get away by yourself or enjoy the company of your group. Our community has activities for all age groups in our large recreation center, arcade, new miniature golf course, snack bars, two pools (one indoor and one outdoor), huge oceanfront observation deck, and 'pocket playgrounds' throughout the community. There is truly something for everyone. Basketball and Volleyball are also onsite. Our lifeguards, gated entrance, patrolling security, and 10 MPH speed limit all will contribute to your peace of mind during your vacation. Just move in, unpack, and unwind! Free Wi-Fi is provided at this home. Wi-Fi is also provided at the Meet & Eat and the Recreation Center. (7) TV's in living room and all bedrooms. Loved the location, just steps off the beach. Ocean Lakes is a great place to vacation. Huge, roomy house with several balconies to sit and read while having a view and sounds of the ocean. We really enjoyed our month there. We only used one bedroom but the bed was comfortable. I only gave it 4 stars because it could use some updating, but there was no actual problems. Megan was great deal with. She always returned our calls promptly. We're so glad you enjoyed your stay. We look forward to having your family stay with us in the future! We're so glad you enjoyed your stay and your time with family. We're delighted the house has met your family's needs and look forward to welcoming you again next Thanksgiving! I’ve been going to ocean lakes for over 20 years. It’s a great place for families and kids. This house was located steps from the ocean which was more than convenient. However the house itself needs work. One of the bedroom on the main floor had several signs of water damage and there was a bucket left on the floor to collect water. The carpets looked grimy and dirty (I kept flip flops or house shoes on the entire time). One of the beds comforter was covered in dog hair and smelled like a wet dog. The mats in the bathroom need to be thrown out they were so dirty and worn I’m amazed they don’t change them exp when they are they cheap $5 kind you pick up at Walmart. For the price per night, I DO expect the property to be clean and not feel like I need to put a towel on the couch before I sit down. The owners really need to take the time to have the place worked on and updated. I wouldn’t stay in that house again and would advise looking for another property. Thank you for taking the time to comment. While we didn't hear from you during your stay, we did have this house slated for some updates but had to wait until after the house was open. Since your stay, all carpets have been cleaned professionally, the drywall repaired, and all new den furniture (leather with recliners) have been added. We regret that the updates had to happen after your stay, but we had to wait for an open week. We hope to have you stay with us again in the updated home. Loved the house and close proximity to the beach! The amenities were a good deal too. The ONLY setback were the TVs. They're were a lot of remotes. Good thing we were on vacay and my kids only watched cartoons at night (in the living room). I would get this house again for a large family vacation. This was a great rental property for a large group. Plenty of room for the 15 we had in our group. Very close to the beach as well, you will not need to take a cart to the beach. House was clean and linens were very reasonable. They gave us extra linens and PLENTY of towels. The kitchen had all the items necessary to prepare meals. Plenty of great views from the balconies - almost every room has balcony access (I think every room except for 1). Would highly recommend this property and also the rental company that owns it. ALL SEASONAL RATES ARE "FROM" THE PRICE LISTED. Pricing may change during that seasonal period. There is no way to include that option on VRBO. Ex: During the late summer rate, it is listed as $2500/week. Our summer rate ranges from $3450 the first week of August to only $1450 the week of Sept. 17-24. PLEASE CALL FOR CONFIRMED PRICING. Linens are included during peak season.